Jointed goatgrass (Aegilops cylindrica) is a winter annual grass native of southern Europe and western Asia. Jointed goatgrass is generally found in areas of 10 to 20 inches of annual rainfall and in elevations of 800 to 4,000 feet. Jointed goatgrass is closely related to wheat and the two species share a similar genome (D genome). 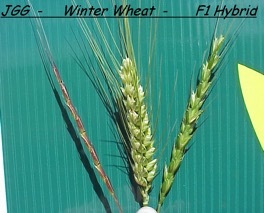 Wheat and jointed goatgrass can cross to form a sterile hybrid (see photo). Jointed goatgrass is difficult to distinguish from wheat early in growth but can be distinguished when the spikes appear. Jointed goatgrass spreads exclusively by seed and is a contaminant of winter wheat. It is very difficult to separate jointed goatgrass segments from wheat seed due to similar size and weight. A jointed goatgrass plant can produce up to 100 spikes, 1,500 joints and up to 3,000 seeds in a single plant. Approximately 75 to 80 percent of the spikelets contain 2 seeds and about 20 to 25 percent of the spikelets contain 1 seed. 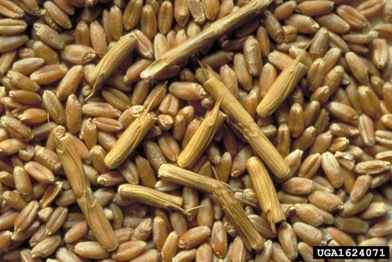 A very small percentage of spikelets may contain 3 seeds. The leaves of jointed goatgrass are up to a ½ inch wide, and have evenly spaced fine hairs along the leaf edges and down the sheath opening. Stems can grow up to 4 feet tall and are tipped with slender, cylindrical spikes that appear to be a series of joints stacked on top of each other. Prevention: Identify plants and avoid introduction of seeds by contaminated equipment or field edges. Plant clean seed because jointed goatgrass seeds are often found as a contaminant in small grains (see photo). Cultural: Crop rotation is an effective control method. The use of a broadleaf crop can aid in breaking the cycle of jointed goatgrass infestations in grass-like cropping systems. Mowing can be effective in roadsides, fencerows and non-cropland areas; however, timing is critical. Burning can reduce seed by 80% if sufficient residue is present; however, seeds buried in the soil will remain viable. Moldboard plowing can be used to bury seedlings at least 6 inches; however, seeds brought up through plowing will cause additional populations to develop. Biological Control: There are no biological control measures available for jointed goatgrass. 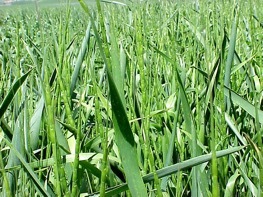 Chemical Control: The use of nonselective herbicides (glyphosate, paraquat, glufosinate) for control of jointed goatgrass should be considered following wheat harvest and in the early spring in a wheat fallow rotation. If precipitation events occur during the fallow season and the fall prior to planting consider nonselective herbicide applications prior to planting a new crop. Postemergence control of jointed goatgrass in cereal crops is limited. The use of the Clearfield production system has been very effective for the management of jointed goatgrass. This is as herbicide-tolerant wheat to the chemical imazamox (Beyond). Jointed goatgrass is extremely sensitive to this chemical and complete control can be obtained, however, misuse and continued use can lead to herbicide resistance within jointed goatgrass. 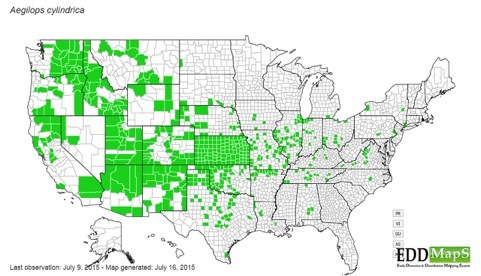 Confirmed resistance of jointed goatgrass has been confirmed in eastern Washington. To prevent resistance and manage goatgrass populations, use herbicide with a different mode of action on a rotational basis and implement alternative crop rotations. Please refer to the PNW Weed Management Handbook for additional information. Photo courtesy of Steve Van Vleet.